Art for the people made by the people. Open Eye Art custom designed and painted 6 large panels with a series of Aspen trees that climb several stories and serve as a comfort to the parents and patients who look a little closer at the artwork. Nurses, doctors and staff of the hospital wrote in the “scars” of the trees their healing advice, encouragement, names of past patients that had touched them in a profound way. It is a very moving piece to experience in person. Ruby’s headquarters’ move to the Fox Tower was celebrated in this interactive doodle panel installation, designed to include meaningful icons, value s and playful midcentury motifs that help make Ruby’s culture unique. 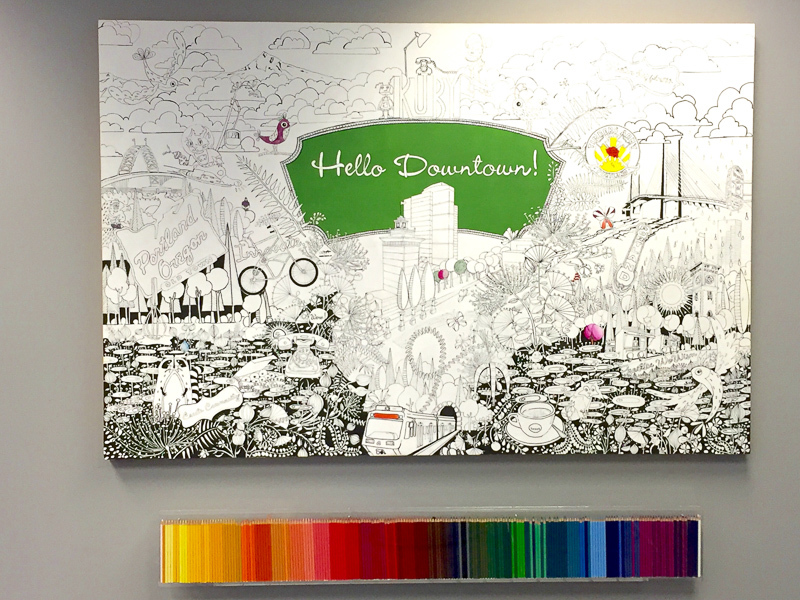 Employees continue to collaborate to create the art. 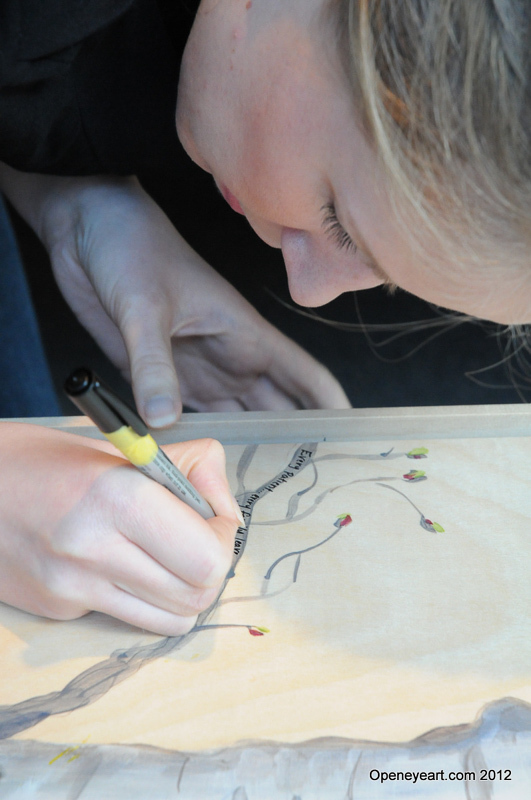 Open Eye Art will finish the art piece for permanent display when they have completed their coloring. 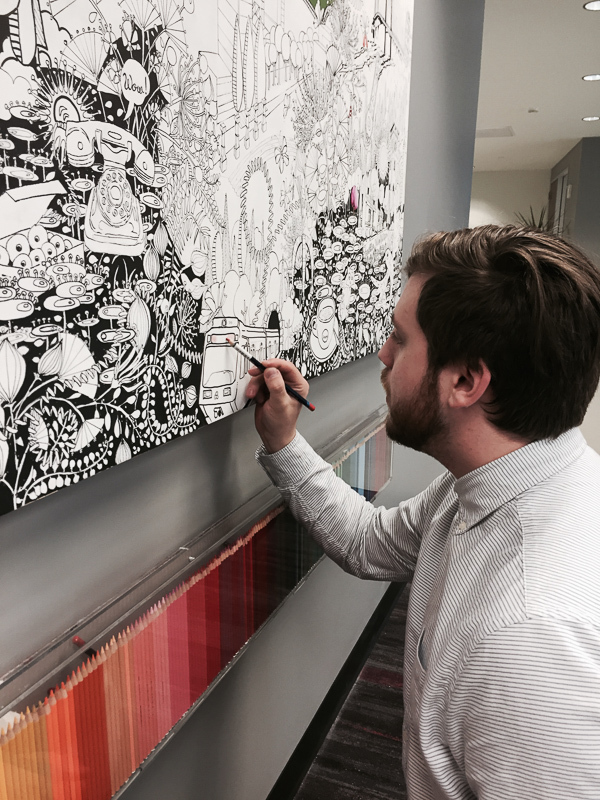 The Atticus Hotel brought the community together to collaborate on custom art that appears throughout the hotel. 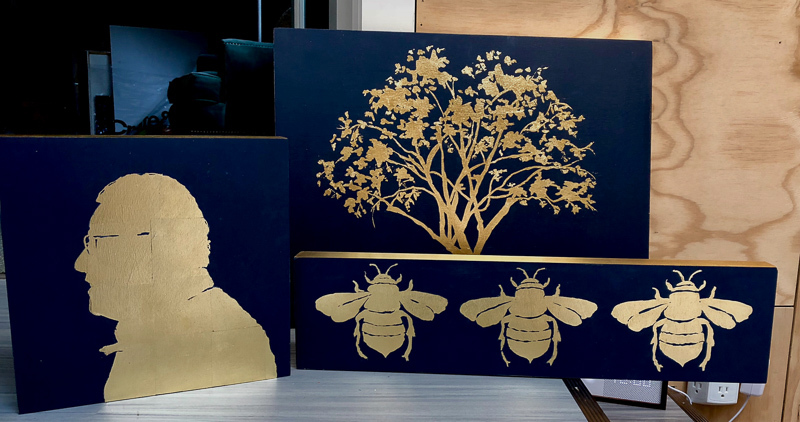 In addition to a community workshop to create art for the hotel, we gilded silhouettes of local community characters and fun iconic symbols of the McMinnville area. Open Eye Art painted custom whimsical botanical, an acrylic abstract landscape and printed a series of ink blot art canvases for many of the rooms. 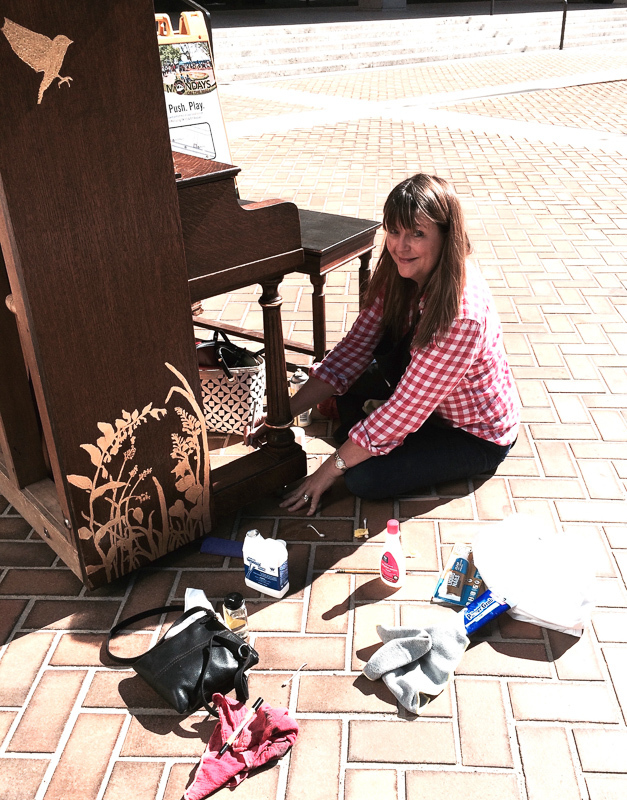 This incredible organization places pianos outside for all to step up and play. 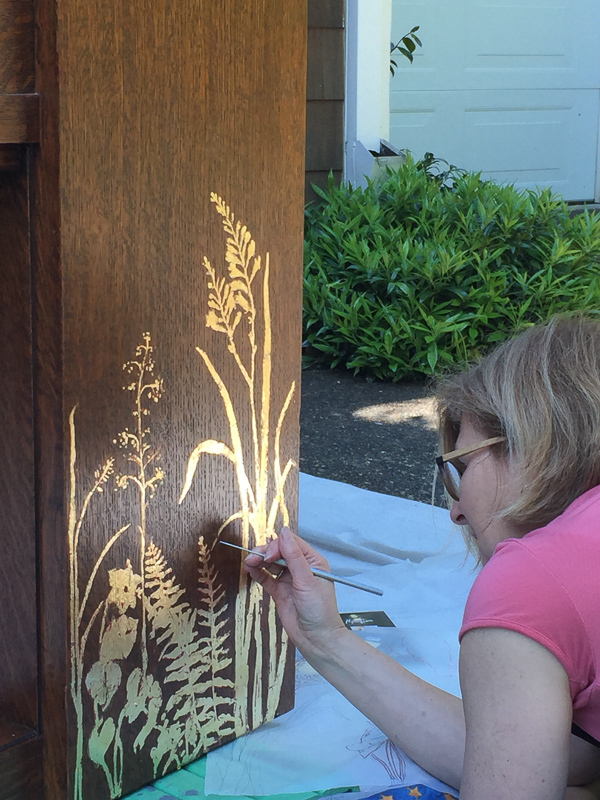 We chose to hand gild an old donated Rembrandt upright piano with gold so it would catch the glistening sun light as it sat on the streets of Portland. Because it sat out in an urban environment we felt it needed a garden of its own so we chose to gild northwest plants and flowers as though they were growing under and along side the piano. Our second piano is a giant raccoon that has been one of Portland’s favorites. Music has a way of expressing our emotions with greater depth than our words can. The Hans Christian Anderson quote, “Where words fail, music speaks” seemed a perfect addition to the face of the gold leaf piano and the statement “Listen to be heard “ was the perfect statement of our times for the Raccoon piano.